Sean Stellmach began his career as a fitness coach at a Fitness Together near his home in Massachusetts. 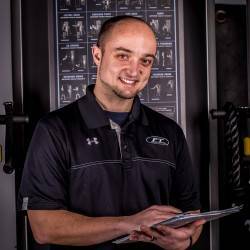 Having entered the field with a bachelor’s degree in community health education from UMass Lowell, and a NASM (National Academy of Sports Medicine) personal training certification, Sean was excited to work with clients and help them achieve results. He was immediately comfortable in the training studio and truly enjoyed coaching clients in their fitness journeys. After just one year, Sean came upon the opportunity to purchase Fitness Together Newburyport where he quickly increased business and churned local interest in his new studio. He compiled a highly qualified team of fitness coaches and witnessed many client success stories, and continues to do so today. Fitness Together Portsmouth was acquired by Sean in early 2012. This studio was built much like the Newburyport location, and is now a premier personal training establishment in the greater Portsmouth area. Sean believes that fitness can and should be fun AND effective. Much of his free time in the summer/fall is spent coaching the Amesbury High girls’ varsity soccer team. But he and his fitness team understand that sometimes, exercise takes a back seat in life, and it’s difficult to begin any fitness program. His goal is to motivate, empower and improve the overall health of each and every client who walks through his doors.